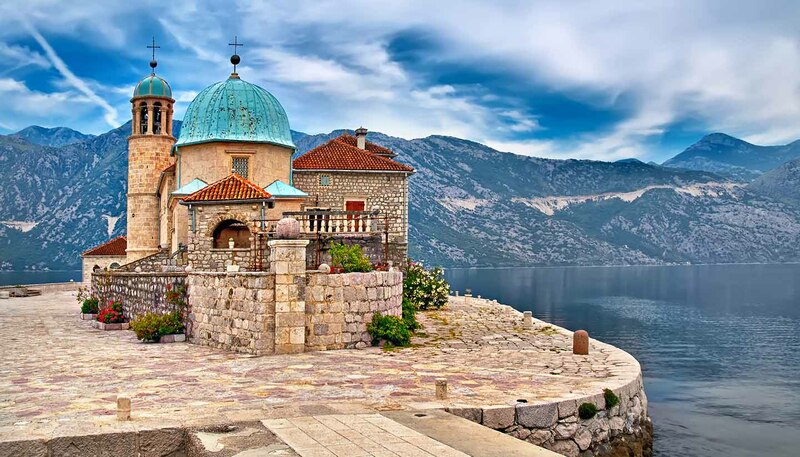 Montenegro is often considered a new country, having only gained independence from Serbia in 2006. However, its history goes back millennia, and it is closely intertwined with that of its Balkan neighbours. Montenegro's first known inhabitants were the Illyrians, a warlike Bronze Age people present along much of the East Adriatic coast. The Ancient Greeks arrived in the 4th century BC, founding the coastal town of Budva, though by the 1st century AD the entire area was absorbed into Roman Empire. It is around this point that the Illyrians proper were extinct. The Slavs arrived in the 7th century, mixed with descendants of the Romanised Illyrians, and adopted Christianity. A proud warrior people, they lived in clans, established their own royal family and secured independence from the Byzantines in the 11th century. The Slavs inhabited much of present-day Montenegro, then known as Duklja, which became the front line in various wars between the Byzantine Empire and Serbian Kingdom. In 1186, Duklja, which had been weakened by infighting, was incorporated into the Serbian Kingdom. The Serbian Empire, which evolved from the Serbian Kingdom, fell apart in the 14th century allowing the region to fall under the spell of the Ottoman Empire. WWI brought the Ottoman Empire to a dramatic end, with modern-day Montenegro forming part of a new country, Yugoslavia, in 1918. After WWII, Yugoslavia was governed by Josip Tito, a “benevolent dictator” whose authoritarian regime kept a lid on the ethnic tensions that existed within Yugoslavia. Tito was a socialist revolutionary and under his rule most businesses were run as workers’ co-operatives. Being a non-aligned country, Yugoslavia kept good relations with both West and East, and allowed its people more freedoms than their socialist counterparts in the USSR. When Yugoslavia began to break up during the 1990s, Montenegro remained loyal to Belgrade. Although there was no actual fighting on Montenegrin territory, the people suffered much economic hardship during that time. Eventually, in May 2006, Montenegro held a referendum and the people voted for independence from Serbia. In 2008, Montenegro applied for EU membership, and in 2012, having proved that it was serious about tackling corruption and organised crime, it opened accession negotiations with the EU. •	Having no currency of its own, Montenegro has unilaterally adopted the Euro, the first non-EU fully recognised country to do so (Kosovo has also adopted the Euro unilaterally). •	Tito’s brand of socialism, often referred to as Titoism, pulled off the enviable feat of appealing to both communists and non-communists. •	Brad Pitt's first lead role was back in 1988, in Dark Side of the Sun, which was filmed by former Yugoslav director, Bozidar Nikolic, in Kotor, Montenegro. Majority Eastern Orthodox (72%, according to the 2011 census), with a Muslim minority (19%) and a Roman Catholic minority (3.5%). The remainder are either Atheist or "other". As in any other foreign country, you should respect local laws and social customs when visiting Montenegro. This is an Eastern Orthodox country, so you should dress respectably for visiting churches and monasteries – legs and shoulders covered, for both men and women. Be cautious when talking about the war and the break-up of Yugoslavia - many people come from mixed families (which might include Eastern Orthodox Serbs, Roman Catholic Croats and Muslim Bosniaks), and “who was right” and “who was wrong” cannot be clearly defined. Also be aware that there is an Albanian minority (predominantly Muslim) in Montenegro, concentrated around Ulcinj. What various individuals think about the current situation in Kosovo will vary from person to person, so avoid entering into heated debate on this topic. Montenegrins are traditional and patriarchal, and the society has a deeply ingrained aversion to homosexuality. Gay visitors are advised to limit public displays of affection. In October 2013, 60 people were injured at the Gay Pride march in Podgorica, when anti-gay protestors threw stones at the demonstrators, and the police responded with tear-gas. Montenegrins enjoy drinking immensely but being able to hold one’s alcohol is a matter of pride, and public displays of drunken behaviour are considered degrading. The official language is Montenegrin, which is basically the same as Serbian and can be written in either Latin or Cyrillic script. The small Albanian minority (approx 5%) speak Albanian.